As we enter a new exciting year, we thought it was time to ask what are the coffee predictions and what could we expect to see in 2018. In this blog, we focus on two specific topics that have caught baristas’ attention in the past few years and are expected to keep evolving even further. From carbonated coffee to cold brew enhanced with flavours or aged in a whiskey barrel, cold brew is getting a lot of attention, growth and activity in the coffee industry. Combining beer with coffee isn’t a totally new concept as a number of coffee roasters such as Stumptown or Intelligencia have been partnering up with breweries to explore the great affinity between the aromas and flavours of good coffee and good beer. But many baristas, roasters and master brewers are collaborating to explore new options and techniques to bring the sensory experience to the next level. We could see some of these techniques performed by California-based Reborn Coffee Roaster who pulled out the victory at Portland’s Coffee Fest in 2017. In 2018, cold brew recipes will be limited only by our imagination, where balsamic vinegar, cacao beans or coconut blossom sugar will become perfect partners and enhancers of the many aromatic compounds stored in coffee. Restaurants might also bring already introduced cold brew cocktails to the next level by garnishing them with coffee caviar (Used primarily for decorating, this method of spherification consists of mixing sodium alginate with coffee, then releasing small droplets of coffee into a water bath containing calcium chloride.) and micro-herbs. And perhaps, competitions like the latte art throw down will soon have a new addition and baristas all over the world will engage in cold brew throw downs. Our friends at Proud Mary Coffee Roasters have been hosting events like this since 2015. 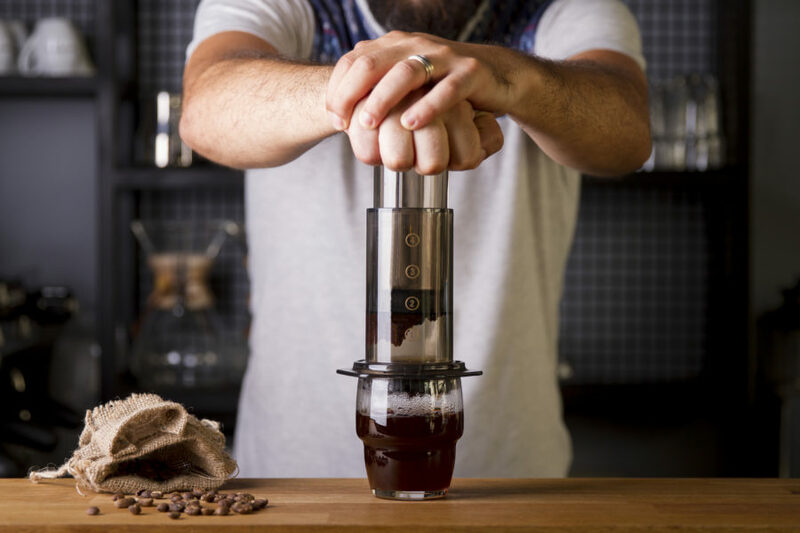 New Aeropress recipes will include coarse grinds with a much higher coffee to water ratio than we are used to for brewing. Using about 28g to 35g of coffee will give a strong concentrate that can be then diluted with pure water. In other words, shorter, sweeter and juicier coffees with bolder body and a clean, balanced finish will be the trend. 2016 Aeropress champion Filip Kucharczyk believes that using a big dose, coarse grinding and low temperature makes for a gentle extraction. Coffee is well under extracted in this method too, and the big dose compensates for it. This way you can make the concentrate pretty much however you wish; different grinds, temperatures, doses. You can play more with the recipe – it’s not set. You can see the same idea being used by the freshly crowned 2017 Aeropress champion Paulina Miczka. Individuals looking for less caffeine will find their coffee alternatives (like loose tea) brewed just like coffee in a Mokapot, or cocoa beans roasted for the Aeropress method and pour over cones. Cold brew cocoa is also a new trend on the horizon for 2018.